What did you like about the book? This is a beautiful book about a little girl who is half Jamaican and half French Canadian….The illustrations are wonderful and the descriptions of the food are perfect. Anything you didn’t like about it? I liked everything about this book. To Whom Would You Recommend this book? This is recommended for children ages 4-7. It would be a good addition to a multi-cultural library. Kindergarten children will also enjoy the story read aloud to them. It will stimulate discussion on race. —Sandra Pacheco ESL teacher, Washington, D.C.
“…A gentle loving explanation of how everyone has different skin tones expressed in warm delicious ways. Bullying is part of the story but Phoebe’s approach of not letting her bullies know that their nickname bothers her helps to defuse any power they have over her. 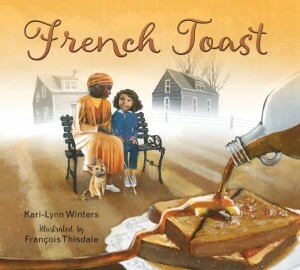 “French Toast is a delicious treat of a picture book that lets you explore a sophisticated topic in a way that is helpful and positive, but not simplistic…. This is a slow unravelling of racism and bullying and how we see ourselves. A slow unravelling, as only the best picture books can do. French Toast is a meal you will want to go back to, and savour with your child, again and again. You will get something different from it each time you share it.